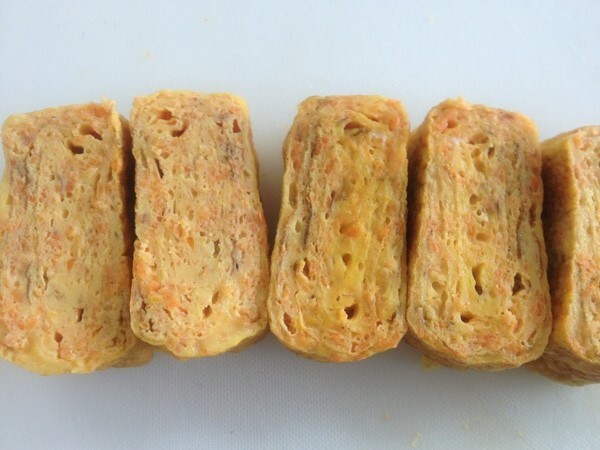 Tamago Yaki is one of the most popular dishes for Bento in Japan. ① Skin and grate the carrot. Place in a heat-resistant bowl, cover with plastic wrap and microwave for 1 minute. Remove the wrap and let cool. ② Crack the eggs into a bowl and mix with chopsticks. Add the carrots, sugar, sake, salt, and smoked bonito, and mix well. ③ Heat a tamago-yaki pan, add a bit of oil and use cooking paper to spread it evenly and thinly. Pour in 1/4 of the egg mixture and spread it over the entire bottom of the pan. When it is half-cooked, fold it back toward you, so that it is only about ３cm wide. Slide the egg to the back side of the pan. Add a little bit more salad oil to the pan and spread thinly. Add another 1/4 of the egg mixture. Cook in the same way as above and fold toward you in the same way as above. Repeat two more times. ④ When the egg is done, enclose it in plastic wrap and let cool. Cut into ５ equal pieces.